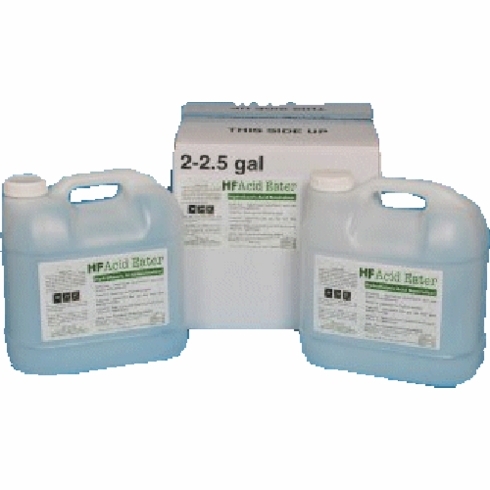 It is strongly recommended to have an HF Acid Eater Kit readily available in case of a spill. Acid Eater Neutralizer completely destroys hydrofluoric acid using a 1:1 neutralization ratio or less with a variety of acids. Neutralizes hydrofluoric acid into safe organic salts and water. Completely destroys the fluoride polymer. Reduces disposal costs and safety hazards. pH indicators eliminate the need for pH strips or meters. Liquid formula generates less gas and heat than powder formulas. Easy to use by spraying on vertical surfaces or pouring in hard-to-reach areas.